The Australian Broadcasting Company’s Future Tense radio program recently did a long interview-format show on free public transit. The whole thing is good. I’m in there for about four minutes starting at 9:30 about the need to focus fare discounts away from the peak rush hour. You can download and listen here. Bus Network Design is a “Hot Trend”! Longtime readers know I’m suspicious of “hot trends,” but it’s great to see that bus network design is finally having its moment in the limelight. The respected public policy magazine Governing has a nice feature by Daniel Vock on bus network redesign. It happens to feature two projects that we worked on, Columbus and Houston, and it has some quotes from me, but it would be a good article even without those things. There’s one mistake in the piece. Vock writes, “Plus, a well-designed bus network can lead to fewer trips because riders have to transfer less to get to their destinations.” I think he means boardings rather than completed trips, but in any case, our network designs sometimes increase transferring, even as they reduce travel time. But it’s a good read. 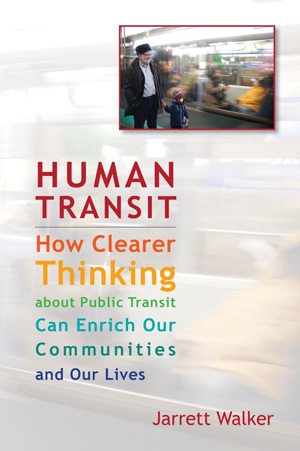 Last week I was a guest on Here & Now, a nationally syndicated radio program produced by WBUR in Boston, talking with the show's Jeremy Hobson about the recently approved Houston METRO Transit System Reimagining, and how its lessons apply to other American cities. The segment aired today, and is a nice summary of the project, quickly covering much of the material discussed here, here and here. Take a listen via the embed above, or head over to the Here & Now site to check it out. The folks at Sustainable Cities Collective have a cool interview with me as part of their Urbanism Speakeasy podcast series. I go on in particular about chicken-egg games between transport and land use planning, about British-style privatization, and about the meanings and dangers of words. Download it at the very bottom of this page, or listen here!